You know those times when a kid asks if they can play on your phone and your gut instinct is to say no because they might break it or get it all sticky? But then you realize that you’re being a control freak and chances are they won’t get it any stickier than you do. However if the game they want to play is “Send Me to Heaven” then your initial instinct was correct. The object of SMTH is to throw your phone as high up in the air as possible—the higher the better. 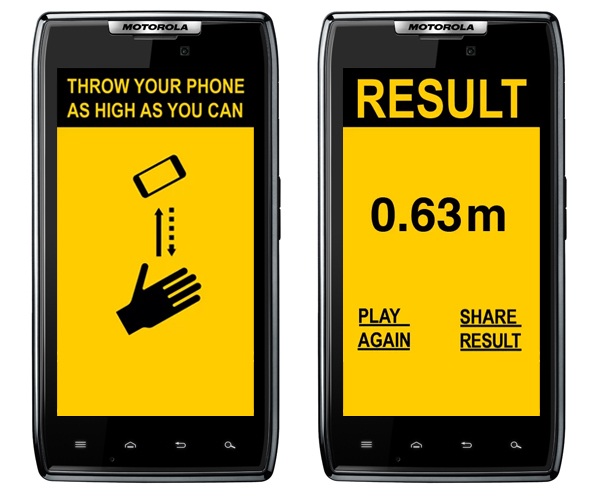 The height is recorded and uploaded to the leaderboards so you can see how your throw compares to other players. Obviously the other unspoken objective is to catch you phone so it doesn’t get smashed into bits.